Wearable computing devices like Google Glass are at the forefront of technological evolution in smart devices. The ubiquitous and oblivious nature of photography using these devices has made people concerned about their privacy in private and public settings. The Face-Block (http://face-block.me/) project protects the privacy of people around Glass users by making pictures taken by the latter, Privacy-Aware. Through sharing of privacy policies, users can choose whether or not to be included in pictures. However, the current privacy model of FaceBlock only permits simple constraints such as allow versus disallow pictures. In this paper, we present an extended context-aware privacy model represented using OWL ontologies and SWRL rules. 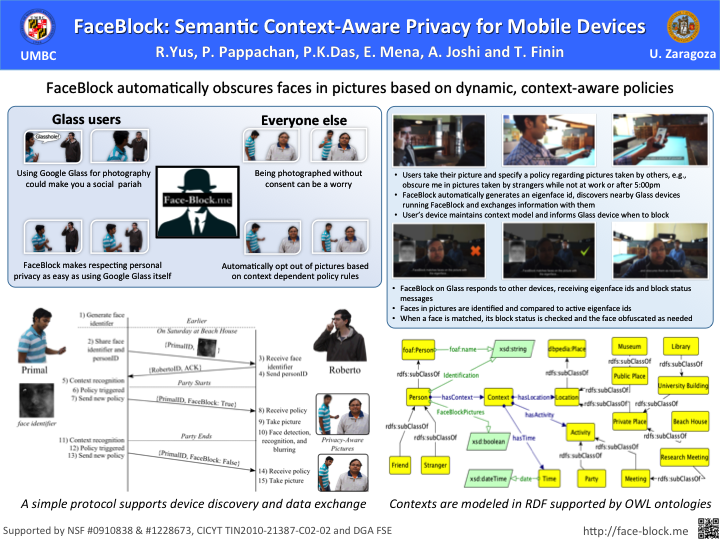 We also describe use cases of how this model can help FaceBlock to generate Privacy-Aware Pictures depending on context and privacy needs of the user.